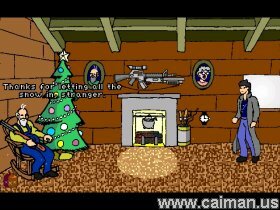 Caiman free games: Barn Runner 4 by Scott LeGere. T'was the early afternoon before Christmas and Detective Prick Peckard, pride and joy of the Robot Crimes Division, had finally cornered a fugitive robot that had eluded him for three days in the untamed winter wilderness of the Blue Grass Containment Zone. Can Prick deal out justice to the murderous robot and still make it home in time to unwrap presents? 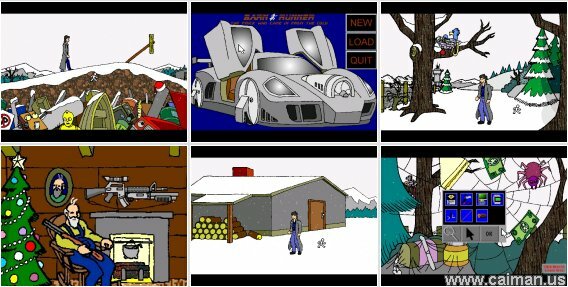 Barn Runner 4: The Prick Who Came In From The Cold is made in the style of the adventure games of yesterday where you collect items you find along the way, talk to people you meet in your travels, and pay close attention to clues in your environment. Of course, as this is just a small game, there are only about a dozen items to find, only one person to talk to, and a rather limited world to explore. This game also provides a great deal of back story for the Barn Runner universe (though you'll have to do a lot of looking around and ask a lot of questions to find it all). 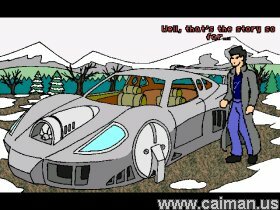 For the die hard Barn Runner fan who wants to know more about the wacky world Prick inhabits, this is the game for you. For more info see the nice manual.pdf included in the download. Barn Runner 5: The Fore.